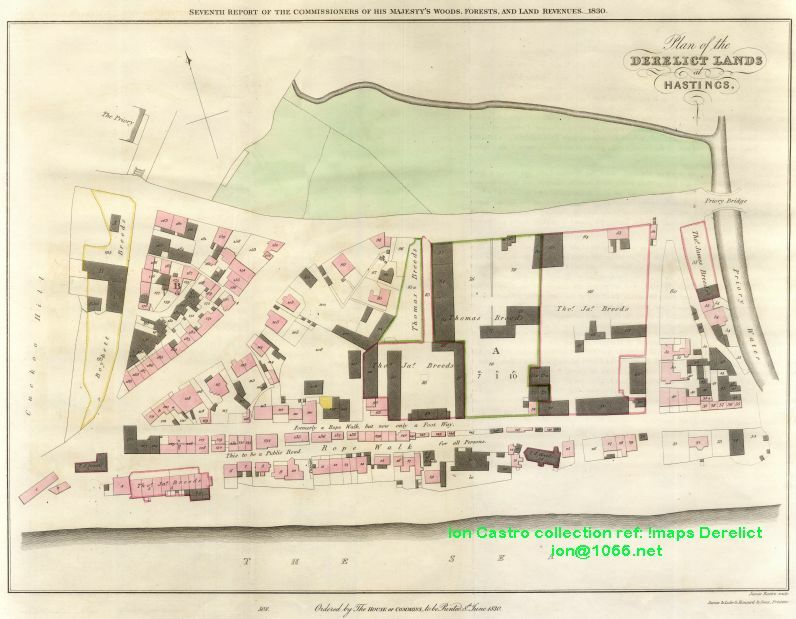 In central Hastings is an area covered by Harold Place, the Queens Hotel, Robertson Terrace, Carlisle Parade, White Rock, Robertson Street, Trinity Street, and Claremont, this area to the West of the Priory-Stream was outside the Hastings Borough boundary and was the result of the sea receding. This land was settled by squatters who named it "The America Ground" and declared themselves independent of Hastings. They built houses shops and warehouses and paid no rent rates or taxes. The borough suggested that lawlessness was rife and the government should take steps to get rid of the nuisance. plan of the the America Ground - The "Derelict Lands"
The Great Inundation of the year 1236 had the most extraordinary and lasting effects on the Sussex and Kentish coastlines. This series of great storms left the Kentish port of Romney landlocked, with its river, The Rother entering the sea 12 miles to the West at Rye in East Sussex. The great Dinsdale Forest that stretched from Hastings to Rye vanished completely, lost forever to the seas. 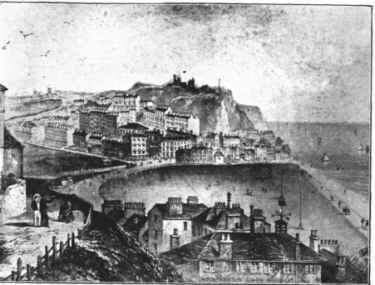 And finally and most importantly for our story the storms left a huge deposit of material blocking the great harbour of Hastings, previously identified as the best natural port on the South coast. It was this vast bank of shingle that was to become the America Ground. 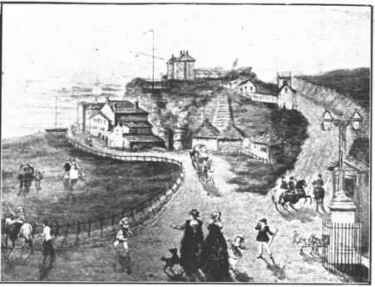 The White Rock, showing the road round it and the " America Ground" covered with buildings, about 1824, before being cleared by the government. To the present day observer, large areas of flat ground do not seem to be lacking on the seafront at Hastings but times have changed. 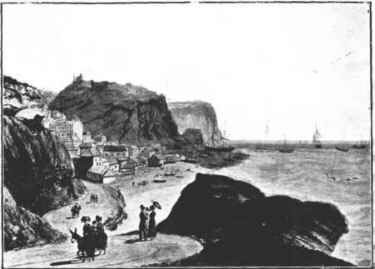 Where formerly the sea pounded great cliffs and scoured the beaches now promenades abound. Every inch of ground was at a premium. Look at the old houses clinging to the cliffs for proof of this. It was logical therefore that a ropewalk was developed on the new shingle bank, it was probably the flattest, straightest piece of ground for miles. The practical logic of working folk would demand that nothing was wasted so derelict boat hulls were pressed in to service to provide cover against the weather. The effect and requirements of rope-working would both need and produce a long straight hardened surface, in modern times we forget the luxury of a hard, well-drained area on which to move around. That this became the main thoroughfare of the future America Ground should be no surprise to us. The ropewalk became something of attraction to the rich and idle, as always, the industry and ingenuity of the poor and needy when fighting poverty and starvation was considered "quaint". And many drawings and prints were produced of this extraordinary construction. A certain legitimacy for the presence of the ropemakers was gained by the payment of small rents to Hastings Corporation (possessors of a powerful Elizabethan Charter) and the Earl of Chichester who held the Castle lands. Ropemaking on the shingle bank had virtually ceased by the 1820s due mainly to the advent of the Industrial Revolution and the coming of factory-made cordage, whether home produced or imported. But by now a new industry was emerging. Quaint Hastings, facing South and in easy reach of London, was the ideal resort for the affluent middle classes, where they could both enjoy the views and cast a superior and critical eye over the fascinating, hardworking fishing port to the east in Hastings Old Town, then reaching its peak, providing the South East of England with its breakfast kippers. At this time as I have indicated before, land was very much at premium and the near derelict Ropewalk provided perfect lodgings for the growing numbers of workers (and those providing for their needs and requirements) employed on the various construction projects in hand. 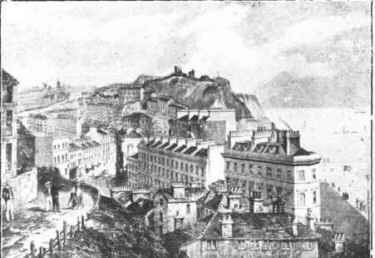 The removal of the West Hill cliff and the subsequent building of Pelham Crescent (1820s) in its place foremost among them. By 1822 it was estimated that more than 1000 souls had acquired ramshackle, incommodious but rate-free accommodation on the shingle bank, guaranteed to provoke the great and the good on the Borough Council, Aldermen and councillors alike. Added to the freedom from expense there was the allegation (equally provoking but largely unfounded) of lawless and licentious behaviour amongst the inhabitants of this motley collection of habitations. A few half-hearted attempts were made to impose official control and the immediate response to this was the American flag (a contemporary symbol of freedom) being run up in defiance. And so the America Ground was born. This is well underlined if time is taken to study the survey carried out *after* the Crown Commissioner's Inquisition mentioned below. And reported in the Seventh Report of His Majesty's Commissioners, dated 8th June 1830, published and printed on the order of the House of Commons. The survey, which appears as Appendix 15 & 16 of the report, makes interesting reading. It shows that contrary to popular understanding that there was a dispute over the ownership of the land. On the one hand, Lord Chichester as holder to the Castle lands laid claim to it under a grant made to his family under James the 1st. And on the other Hastings Corporation claimed it under their Charter from Elizabeth the 1st. included warehousing for tallow, rope and coal. Lime-kilns were present as were a sawing house, stonemasons and a tallow factory, multiple piggeries, a slaughterhouse and butchers. There was a gin palace, and perhaps surprisingly a school. This does not on the face of it suggest the sink of iniquity rumoured among the rest of the Town of Hastings but more that of simple folk getting on with the business of life. "....while we shall have succeeded in acquiring on the behalf of the Crown, the disputed possession, at the end of seven years, a very valuable Estate, from which no profit or income has hitherto been derived by the Crown." So what did the surveyors, Messrs Driver of Battle find? The Brig "Polymina" converted into a cottage in 1806 and gardener, James Howell's, mobile home. Of the rest of the accommodation listed, the majority appears to have been brick and stone. Timber buildings certainly existed but appeared to be generally for workshops and animal containment. 199 premises (some of them given the same number several times) and 99 prospective lessees are named. One can only speculate as to why the number of properties were kept below 200 and the lessees below 100. 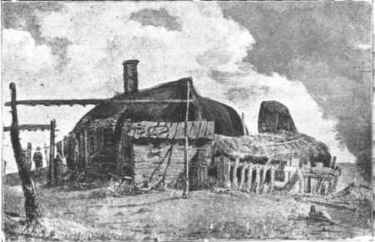 Sheila Kaye-Smith allegedly describes the America Ground and its inhabitants in her book "Tamarisk town" she writes "As the Council knew, it was at present no man's land and therefore free to any beggars, gypsies or other undesirables who might settle on it, with the result that a mock city of shacks, huts and tents encroached on the western end of the town..."
The reader can draw their own conclusions as the nature of the community these people created. Though I do observe that there is neither solicitor nor minister of the church listed in the survey. The first signs of trouble began when it was found that no title deeds existed to enable the sale of property on the America Ground and the matter was referred to the Crown Authorities. And in turn the query was passed on to the Commissioners for Woods, Forests and Land Revenues. An inquisition was called for, and another claimant duly appeared on the scene, Lord Cornwallis, holder of the Priory Estate. Now there were three, Lord Cornwallis, The Earl of Chichester and Hastings Corporation. Later, Battle Abbey Estates (Sir Godfrey Webster) would be invited to make a claim. On the 6th of December 1827, five commissioners and twelve jurymen met at the George Hotel at Battle and quickly decided that the lands should be seized on behalf of the King. There is no record on documents of the residents of the America Ground being consulted or even referred to.